First, you need to make pasta dough. It is actually pretty easy to make homemade pasta, but it is easiest if you have a pasta maker. If you don’t have one then it may be more difficult to get the pasta as thin as you want, and you would have to hand cut the fettuccine. It’s not impossible to do, but it is going to be a little more work. As a solution you could just buy pasta at your local grocery store instead, if you don’t want to make homemade pasta. I will say, though, that once you have had homemade pasta you can really taste the difference. It is creamier, and has a better texture and flavor. I really love it. So, if you would like to try it this is the recipe. Now onto the meatball recipe. 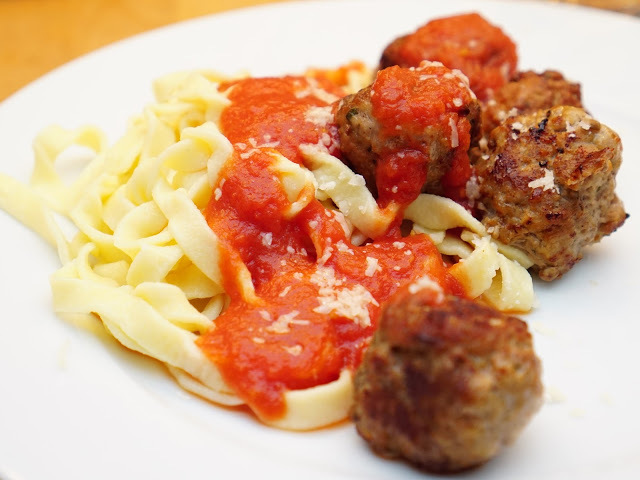 🙂 This is a recipe, by Gordon Ramsay, that I found online three years ago, and I have to say these meatballs are the best I have ever tasted. The recipe is so easy that I feel anyone can make this. I usually use dry parsley, and have added salt and pepper to the recipe. 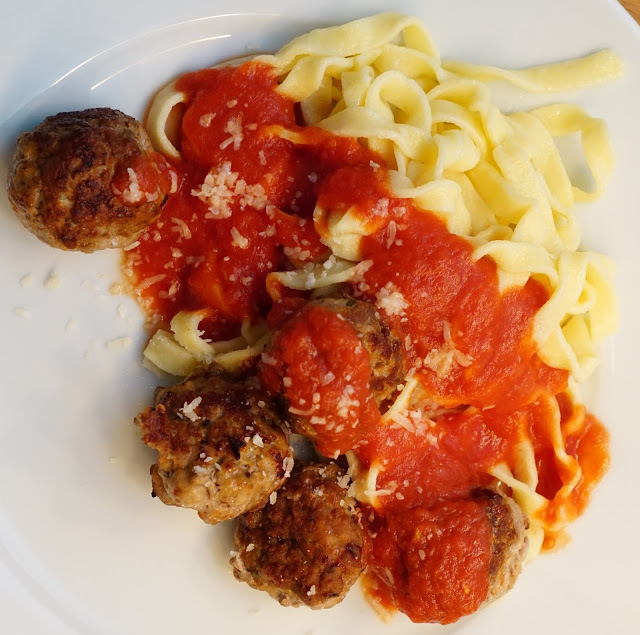 You can always prepare the meatballs while the homemade pasta dough is chilling in the fridge. In a medium bowl, place 3 tbsp breadcrumbs, and drizzle milk on top, just enough so the bread crumbs soak up all of the milk, so it is a very little amount. Then, add the rest of the ingredients to the bowl, and with your hands mix it altogether. Cover with plastic wrap, and place in fridge until ready to use. Next, place a non-stick frying pan on the stove on a medium to high setting. Then, shape the meat into walnut sized balls, and lightly coat with flour. 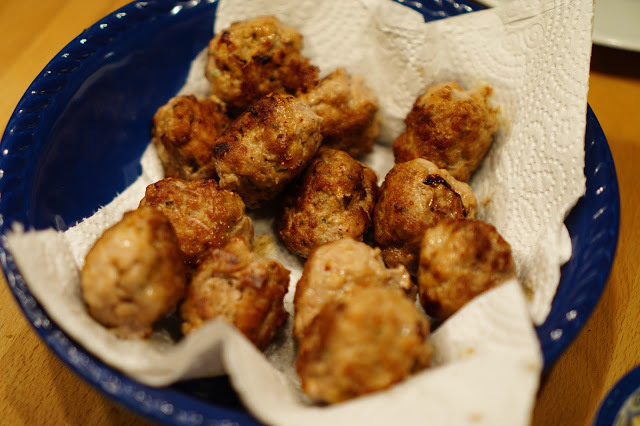 Finally, fry the meatballs in olive oil until golden. You will have to flip them over, and my advice is to let them sit a bit on each side so they get nice and toasted. Tip: You can prepare the pasta sauce in the meantime. To make a simple pasta sauce just blend a can of pelati (whole tomatoes) in a chopper mixed with a couple of pinches of salt. Place in a sauce pan and warm on a medium to low setting until time to serve. With a good can of tomatoes you don't have to add a lot to them so don't buy the cheapest kind you can find.